Banff is the perfect base for your ski holiday in Canada as you have access to six ski resort areas: Banff Norquay, Sunshine Village, Lake Louise and day trips to Kicking Horse and Panorama as well as nearby Nakiska ski resort you can drive to. Also, there are many winter tours to choose from out of Banff . When you stay in Banff, your ski lift pass, the Tri-Area ski lift pass, covers the three nearest ski resorts: Banff Norquay, Sunshine Village and Lake Louise INCLUDING the return ski shuttle to and from any of these ski resorts. 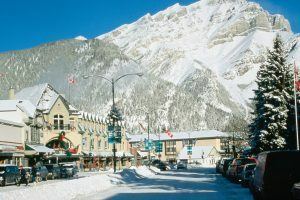 The nearest, and only, ski-in/ski-out property in Banff is the Sunshine Lodge (formally known as the Sunshine Inn), located at Sunshine Village. Banff is located in Canada's first national park, Banff National Park, established in 1885, the third in the world to be created. The Cave and Basin site in Banff, the only home in the world to the Banff Springs Snail, triggered the creation of Canada's first park, and is now a designated UNESCO World Heritage Site. Banff is an easy 1.5-2 hour drive from Calgary International Airport and easily accessed using our private or scheduled airport transfers. This journey along the Trans-Canada Highway is very scenic as you travel from the end of the prairies through the foothills to the Rocky Mountains. Lake Louise is about another 40 minutes drive from Banff continuing along the Trans-Canada Highway and if you have more time you can take the alternate route along the scenic Bow Valley Parkway where you can spot animals such as Elk, Deer and Big Horn Sheep in the winter time. Banff is located at an altitude of 1,384 meters (4540 ft). There are over 100 places to eat out at in Banff with a wide variety of selection such as Canadian, Mexican, Japanese, British or Greek cuisine. With many ski accommodations to choose from, you will be spoilt for choice in Banff - there is something for everyone!